The Smart Araneta Coliseum during the Game 1 of the Barangay Ginebra–Meralco championship series for the 2016 PBA Governors' Cup. In 1952, J. Amado Araneta, a member of the Araneta family, purchased from Radio Corporation of America (RCA) 35 hectares (86 acres) of land in Cubao which includes the Araneta family home and is bounded by Epifanio Delos Santos Avenue or EDSA, Aurora Boulevard, P. Tuazon and 15th Avenue. The Araneta Coliseum was constructed from 1957 to late 1959, and designed and built by Architect Dominador Lacson Lugtu and Engrineer Leonardo Onjunco Lugtu. From 1960 to 1963, the Coliseum received international recognition and was recognized as the largest covered coliseum in the world. Today, it remains one of the largest clear span domes in the world with a dome diameter of 108 meters. It occupies a total land area of almost 40,000 square metres (430,000 sq ft) and has a floor area of 23,000 square metres (250,000 sq ft). The coliseum opened on March 16, 1960, with Gabriel "Flash" Elorde boxing for the World Junior Lightweight crown against Harold Gomes. General admission then was 80 centavos and the reserve section was five pesos. Among the notable events to take place at the arena were the 11th and 34th FAMAS Awards, the 1975 "Thrilla in Manila" boxing match between Muhammad Ali and Joe Frazier, in which the arena was renamed into the "Philippine Coliseum", and the annual Binibining Pilipinas beauty pageant. The Philippine Basketball Association (PBA) has played more than a thousand games at the Araneta Coliseum as of today[when?]. Other basketball events hosted by the arena were the 1978 FIBA World Championship, a game between the 1978 NBA champions Washington Bullets and a PBA selection in 1979, and the 1982 Asian Youth Basketball Championship where the Philippines defeated China in the final. Araneta Coliseum logo from 1999 to 2011 prior to naming rights deal with Smart Communications. In the third quarter of 1998, the Aranetas and Pilipinas Shell (local arm of Royal Dutch Shell) started negotiations for a naming rights deal that would have lasted until 2008. The Aranetas, who wanted to retain their name at the arena rejected proposed name "Shell Coliseum at the Araneta Center". Instead, the parties agreed on a contract where Shell's name and logo will be painted at the arena's basketball court, a move that was almost shelved due to objections from other PBA teams because Shell owned the then-PBA team, the Shell Turbo Chargers. In 1999, the coliseum underwent its first major renovation at the cost of P200 million. The major changes include the renovation of the lower box area, replacement of seats for the patron and lower box sections, and installation of a four-sided center hung scoreboard. The section names were also given numerical designations: 100 for Patron section, 200 for Lower Box, 300 for Upper Box A and 400 for Upper Box B. In 2006, a LED display was added to the scoreboard. From 2001 to 2008, the highest grossing event at the arena is the Pacquiao vs. Larios boxing fight between Manny Pacquiao and Óscar Larios, earning 96.2 million Philippine pesos. A concert by Westlife was attended by 17,887 people and earned 18.5 million pesos, while a Cliff Richard concert earned 17.2 million despite being watched by 5,647 spectators. 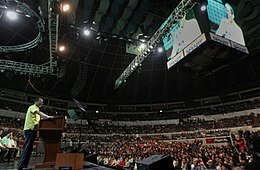 Prior to the Ultimate All-Star Weekend in July 2011, it was announced that the Aranetas entered into a naming rights deal with mobile network operator Smart Communications, Inc. (a subsidiary of Philippine Long Distance Telephone Company), renaming the arena into "Smart Araneta Coliseum". The deal was for five years and includes improvements the arena such as the installation of escalators to improve access in the upper box and general admission areas, and the construction of a parking lot that can accommodate up to 2,000 cars. Additional improvements were made in 2012, including the renovation of the Red Gate entrance and the Green Gate side facade, and the replacement of Upper Box level seats, thus increasing its seating capacity. The Lower Box and Patron sections were combined to make a new Patron section (100 and 200 level seats). A pathway between the former Patron and Lower Box sections was also made. The former Upper Box A section (300 level seats) was renamed as Box section and the former Upper Box B section (400 level seats) is now referred as the "Upper Box" section. In January 2015, the Hydra-Rib basketball backboard first used in 1995 was replaced with a Spalding backboard. The backboard was first used in Game 1 of the 2014–15 PBA Philippine Cup Finals. and off season opening games and championships, and also the Maharlika Pilipinas Basketball League. The facility has also hosted the 1975 Thrilla in Manila, 1978 FIBA World Championship, the 2007 Philippines World Pool Championship and the 2017 SEABA Championship. The coliseum will also be one the venues for the upcoming 2023 FIBA Basketball World Cup. The coliseum also hosts concerts, shows, graduations, seminars, ice shows, circuses, and beauty pageants. To date, TNT BOYS are the youngest performers to stage a concert in the coliseum at the age of 12, 13 and 14 with their Listen: The Big Shot Concert held on November 30, 2018. Eat Bulaga!, the longest running noontime show of the Philippines, also used the coliseum for some special events such as its TV special Eat... Bulaga! : Moving On on February 18, 1989 and its 10th anniversary on September 23, 1989 in ABS-CBN and Eat...Bulaga! : The Moving held on January 28, 1995 on its new home, GMA Network. The coliseum has hosted the Binibining Pilipinas pageants annually. From 1990 until 2016, the coliseum hosted Disney on Ice productions during the holiday season; in 2016, the Mall of Asia Arena in Pasay began hosting these productions. At the turn of the new millennium, Regine Velasquez held her iconic two-night sold-out concert entitled R2K: The Concert, in support of her album R2K, on April 7 and 8, 2000. R2K The Concert which became the most attended concert at the coliseum with over 37,000 attendees, was center staged and has used the seating capacity to its 360-degree maximum. Some notable international performers include Air Supply on 2008, Akon (on July 4, 2009), Kelly Clarkson as part of her All I Ever Wanted World Tour on May 1, 2010, Incubus (in 2008 and 2011), Carly Rae Jepsen (in 2013 and 2015), Lady Gaga as part of her The Fame Ball Tour on August 11, 2009, Avril Lavigne as part of her The Best Damn Tour on September 3, 2008, The Black Star Tour on February 16, 2012 and the Avril Lavigne On Tour on February 17, 2014, Kylie Minogue as part of her Aphrodite: Les Folies Tour on July 5, 2011, Bruno Mars as part of his The Doo-Wops and Hooligans Tour on April 8, 2011, The Script (in 2011 and 2013), Snow Patrol (on August 9, 2012), Taylor Swift as part of her Speak Now Tour on February 19, 2011, and Westlife in 2001, 2006, 2011, and 2019. as well as the American Idols LIVE! Tour 2011 (on September 21 and 22, 2011), and the American Idols LIVE! Tour 2012 (on September 21, 2012). Following her performance with the American Idols LIVE! Tour 2012 five months prior, Filipino-American American Idol runner-up Jessica Sanchez had her first sold out solo concert at the coliseum on February 14, 2013. The coliseum also housed K-pop artists like Super Junior's Super Show-the first Korean to perform in the arena, 2NE1, SS501, CNBLUE, Beast and EXO. K-Pop group U-KISS also had their concert at the big dome and later released into a concert DVD dubbed as U-KISS 1st Kiss Tour in Manila DVD. It was the first time that an international artist released a concert DVD featuring the coliseum. GOT7's first fan meeting in Manila was also held in the Coliseum last November 14, 2015. On October 12, 2014, the main celebration of the 75th Diamond Anniversary of Quezon City was held at the coliseum. The Coliseum is also the home to the annual ABS-CBN Christmas Special, which is typically held during the early weekdays of the second week of December. Filipina girl group DIVAS, which is composed of Kyla, Yeng Constantino, KZ Tandingan and Angeline Quinto staged two concerts at the Araneta, their first concert titled DIVAS Live in Manila, and another one in 2018 with Boyz II Men titled Boyz II Men with DIVAS. The Coliseum has hosted the A Song of Praise Music Festival Grand Finals Night annually since 2012, and the Wish 107.5 Music Awards annually every January since 2016. The Big Dome also hosted a praise and worship concerts like Israel Houghton, Parachute, Don Moen, Darlene Zschech & The Hillsong Worship Team, Sonicflood, Planetshakers, Hillsong Young & Free and Hillsong United. Starting 2017, The Annual Planetshakers Conference is being held at the coliseum. The Big Dome is also the venues of religious gatherings like the anniversary celebration of Members Church of God International also known as the Ang Dating Daan, Christ's Commission Fellowship, Iglesia ni Cristo, International Convention of Pentecostal Missionary Church of Christ (4th Watch), Jesus Is Lord Church Worldwide, Jesus Miracle Crusade, Kingdom of Jesus Christ (during early years), Shalom CCFI (Every Holy Week), the Special Assembly of Jehovah's Witnesses and Victory Christian Fellowship, and different talent search finales, like Pinoy Big Brother, Pilipinas Got Talent, Philippine Idol, Starstruck, and Artista Academy (which held its one-time grand audition at the coliseum). On October 1, 1975, when the Thrilla in Manila took place, the Coliseum was filled with more than 50,000 people despite the hot & humid temperatures, and breaching the total design capacity back then of the Coliseum, consisting of over 36,000 people. On October 15, 2014, the third game of the UAAP Season 77 Men's Basketball Tournament Finals Series between the FEU Tamaraws and NU Bulldogs set the all-time basketball attendance record of 25,138 which broke the previous record last October 8, 2014, the second game of the series (one week before the third game) attendance of 24,896. For the PBA, On February 12, 2014, the seventh game of the 2013–14 PBA Philippine Cup Semifinals series between Barangay Ginebra San Miguel and San Mig Super Coffee Mixers set the record of 24,883. ^ "SEATING- Basketball". Smart Araneta Coliseum. Retrieved 8 March 2018. ^ "SEATING- Concert". Smart Araneta Coliseum. Retrieved 8 March 2018. ^ "SEATING- Boxing". Smart Araneta Coliseum. Retrieved 8 March 2018. ^ "10 Popular Venues in Manila for Big Events". Philippine Primer. Retrieved 8 March 2018. ^ "Araneta Coliseum: 9 Things To Know About The Former Largest Indoor Arena In The World". The Manila Project. September 7, 2017. Retrieved March 1, 2019. ^ "Big Dome still main PBA venue, but MOA Arena an alternative option". InterAksyon.com. Archived from the original on 2014-03-06. ^ Henson, Quinito (2008-11-19). "Mecca of sports". The Philippine Star. Archived from the original on 2012-09-06. Retrieved 2011-07-24. ^ "FIBA World Cup: Venues will be ready in 2023". Philippine Star. December 16, 2017. Retrieved January 5, 2018. ^ Tantuco, Vernise (October 6, 2016). "'Disney on Ice' in Manila 2016: 4 things you need to know". Rappler. Retrieved February 19, 2017. ^ Beltran, Nelson (2009-06-05). "Aquino faces rap for allegedly mauling fan | Sports, News, The Philippine Star". philstar.com. Archived from the original on 2012-09-09. Retrieved 2015-08-29. ^ "Carly Rae Jepsen in Manila concert". ABS-CBN News. September 15, 2015. Retrieved September 2, 2016. ^ "Yahoo Celebrity Singapore – Yahoo". Ph.omg.yahoo.com. Retrieved 2015-08-29. ^ "Thia would 'love' to meet Pacman, Aga in Manila". Philippine Daily Inquirer. August 13, 2011. Retrieved September 2, 2016. ^ "The 'American Idol' tour is ready for Manila". Philippine Daily Inquirer. September 8, 2012. Retrieved September 2, 2016. ^ "Dolphy, Jessica Sanchez top 2012 web searches". ABS-CBN News. 2012-12-13. Retrieved 2015-08-29. ^ "3 katao kinidnap ng A-SG | Probinsiya, Pilipino Star Ngayon Sections, Pilipino Star Ngayon". philstar.com. 2010-05-28. Archived from the original on 2012-09-09. Retrieved 2015-08-29. ^ "Kamuning Bakery wins QC award | Entertainment, News, The Philippine Star". philstar.com. 2014-10-11. Retrieved 2015-08-29. ^ "ASOP TV Grand Finals 2012 Winners". ASOP TV. Retrieved 11 September 2013. ^ "Awiting"Ikaw" itinanghal na song of the year sa 2013 ASOP Music Festival". UNTVweb. September 11, 2013. Retrieved January 2, 2019. ^ ""May Awa Ang Dios" is Song of the Year in ASOP TV Grand Finals 3". MCGI.org. September 26, 2014. Retrieved January 2, 2019. ^ "ASOP Year 4 grand winner named". UNTVweb. October 14, 2015. Retrieved January 2, 2019. ^ "19-year old composer wins 'Song of the Year' at ASOP Year 5 Grand Finals". UNTVweb. November 9, 2016. Retrieved January 2, 2019. ^ "MCGI's Overwhelming Support to ASOP Music Festival Year 6 Cited". MCGI.org. November 23, 2017. Retrieved January 2, 2019. ^ "The 4th Wish 107.5 Music Awards: Nominees, New Categories, and More". Wish 107.5. December 12, 2018. Retrieved January 1, 2019. ^ "Planetshakers Conference". planetshakers.com. 2017-01-15. Retrieved 2017-01-15. ^ "Artista Academy: P20M await winners – Tempo – News in a Flash". Tempo. Archived from the original on 2013-05-03. Retrieved 2015-08-29. ^ "Starstruck winners known today". Manila Bulletin. March 12, 2006. ^ "Matiyaga si Sr. Supt. Querol at dapat siyang premyuhan | PSN Opinyon, Pilipino Star Ngayon Sections, Pilipino Star Ngayon". philstar.com. 2004-06-04. Archived from the original on 2012-09-11. Retrieved 2015-08-29. ^ "Game Seven between Ginebra, San Mig Coffee sets all-time record attendance". InterAksyon.com. Archived from the original on 22 February 2014. Retrieved 12 February 2014. Wikimedia Commons has media related to Araneta Coliseum.